Detailed review of Kerastase Powder Bluff Dry Shampoo. See what real experts and actual users have to say about this dry shampoo. Kerastase Powder Bluff Dry Shampoo works well to clean and conceal oil on unwashed hair. This dry shampoo is different from most dry shampoos I’ve used before, but I did end up really liking it! I was thrown off when I first applied the product into my hair because it felt much more like a hair spray than a dry shampoo; it had no pigmentation to it at all and it felt wet and almost sticky. As the product dried, it dried into a matte powder, still with no pigmentation, but the matte powder was able to absorb my oil and make my hair look clean. The product didn’t add a ton of volume or texture; I felt like it made my hair look like I had just washed it that day, rather than styled it and had second day hair. Dry shampoos normally give me a second day hair, voluminous look but I liked that this could offer me variety if I was looking just to absorb oil and keep my hair looking sleek. Overall, Kerastase Powder Bluff Dry Shampoo worked all day long to keep my hair looking fresh and clean. The look and feel of the Kerastase Powder Bluff Dry Shampoo is different from most dry shampoos I’ve tried. The powder looks colorless and wet when it’s first applied and feels like a hair spray rather than a dry shampoo. I definitely had high hopes for this dry shampoo, but when I first applied it, I wasn’t so sure that it was going to live up to my expectations. 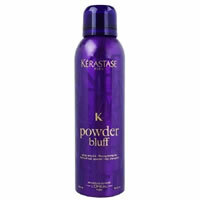 Kerastase Powder Bluff Dry Shampoo is easy to apply from the aerosol bottle. Once it’s in the hair, I wasn’t so sure how to use it since it doesn’t look like a normal dry shampoo on the hair. After it dried down though, it turned matte rather than white and it looked like it was going to blend very nicely into the hair. All I had to do was add a bit more in spots I missed and brush the excess through and it looked great. It gave it a just washed look rather than a second day hair look which I liked. Kerastase Powder Bluff Dry Shampoo takes at least 30 seconds to dry. The smell of this dry shampoo when it’s first applied is really nice; it smells fresh but subtle. The smell goes away as the product dries. Although if I held my hair up to my face, it was still there concealing any dirty smell the hair had. Kerastase Powder Bluff Dry Shampoo provided great results. The product didn’t give me a whole lot of added volume or texture, but it did add a little. As I mentioned before, my hair looked as though I had just washed it that day, not as though it was just styled, but as though it was clean. 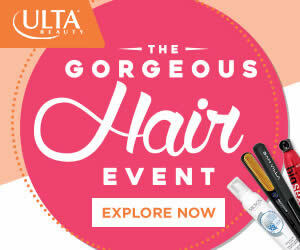 This product provided clean looking hair all day long. Kerastase Powder Bluff Dry Shampoo is $37.00 for 4.3 oz. This comes out to $8.60 per oz, which is definitely pricey for a dry shampoo! Kerastase Powder Bluff Dry Shampoo has a 90-day, 100% money back guarantee. To buy Kerastase Powder Bluff Dry Shampoo, Click Here.